UNCASVILLE, CONN. – June 16, 2017 – The unmatched excitement of charity vehicles sold at Barrett-Jackson will once again take center stage during the 2nd Annual Barrett-Jackson Northeast Auction, June 21-24, 2017, at Mohegan Sun in Connecticut. Among the vehicles set to cross the block is a one-of-a-kind 2014 Hot Wheels® Ford Transit Connect donated by Ford Motor Company to benefit the Darrell Gwynn Foundation. Lot #3001 is a 1996 Ford Mustang built by students at Jordan Vocational High School in Columbus, Georgia. It sold earlier this year at the Palm Beach Auction and was then donated back by the winning bidders, John and Jeanette Staluppi, to spur additional funds for the Jordan students. This Mustang represents the spirit and enthusiasm of the kids who built it, and the entire hammer price will benefit Jordan Vocational High School. 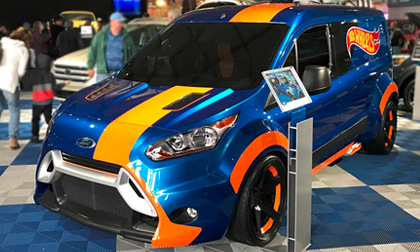 Ford Motor Company is also auctioning the world’s only “life-size” Hot Wheels® Transit Connect. Lot #3002 was revealed at the 2013 SEMA Show and features an entirely custom, Euro-look wide-body kit, gullwing doors, custom 20-inch wheels, sleeping quarters and tool storage. The custom interior has a secondary floor to cover the tool storage, a 55-inch TV, two rear door tablets and Recaro® seats. Because Barrett-Jackson waives all fees on charity cars, every dollar of this vehicle’s hammer price will benefit Darrell Gwynn Quality of Life Chapter of The Buoniconti Fund to Cure Paralysis. The 2nd Annual Barrett-Jackson Northeast Auction will be broadcast on Discovery, Discovery Turbo UK, Velocity and Velocity Canada. For specific television schedules, please click here. The 2017 Northeast Auction Docket is available to view online. Click here to consign a vehicle or visit Barrett-Jackson.com/Bid for information on becoming a bidder.